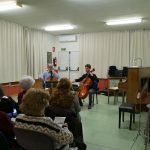 Seon-hee Myong, piano; Guillaume Terrail and Peter Thiemann, cello, performed in a wonderful concert attended by about 60 people. Guillaume is the new assistant principal cellist of the Symphonic Orchestra of the Gran Teatre del Liceu of Barcelona. It was his first performance in an AIMS Social event. We thank him for his participation and involvement!